The dialogue between the West and the East continues to be decisively shaped by various processes of translation, where imported knowledge interacts with local knowledge in a dynamic cycle in which both are transformed to varying degrees. Numerous studies have examined how central concepts in East Asian philosophy such as Yin and Yang (Kim 2001), Confucianism (Rowbotham 1945; Creel 1960; Yang 1987) and Taoism (Csikszentmihalvi & Ivanhoe 1999; Gao 2014) are understood in Western countries. However, most scholars have so far either tended to focus on the reception of such concepts in the target environment or provided purely monolingual analyses of patterns of cultural exchange, while ignoring the role of language as the prime mediator of culture. More importantly, scant attention has been paid to the role of translation and that of translators as active agents in this process. In this traditional scholarly landscape, more attention has been paid to the way western thinking and knowledge are imported and transformed in Asia, ignoring thus the fact that knowledge flow is rarely unidirectional, and indeed confirming that “the West remains the ‘standard’ from which difference is measured” (Wakabayashi 2017). This panel will attempt to explore the dissemination, contestation and transformation of concepts as they travel between Asian and Western countries, with particular emphasis on two aspects of this exchange: the flow of knowledge from Asia to the West through translation, and the way western primacy is sometimes asserted and sometimes challenged as western concepts enter the Asian world through translation. The panel thus seeks to provide an opportunity for scholars to engage critically with the flow of knowledge between Asia and the West at both macro and micro levels. How have key concepts in Asian classic texts such as The Analects, Tao-the Ching, Mengzi, Xunzi, Hanfeizi, Zhou rites, Book of rites and Book of Changes been negotiated and transformed as they travelled to the West through translation? How have key concepts in Traditional Chinese Medicine, such as Yin and Yang, Five Elements and Primordial Qi, been negotiated and contested in translations into English, French, Spanish and other Western languages? How has knowledge of western medicine impacted conceptions of the role of traditional Chinese medicine and the health care system in China, and vice versa? How has Christianity been contested through translations of the Bible in Asian countries that have strong indigenous religions? How have key concepts such as Confucianism and Taoism been reconfigured and redefined by collective intelligence formed through various online/digital platforms, forums and social media networks such as Twitter, Facebook, Weibo, and Weixin? How have translations of western concepts contributed to Asia’s engagement with modernity in the late 19th century and early 20th century? To what extent does Asian modernity transform and hybridise Western modernity? How have Russian conceptualisations of socialism and Marxism been redefined in China and in North/South Korea? Notification of acceptance will be given by 15 June 2017. 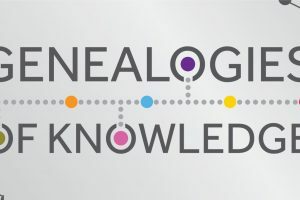 Final Call for Papers for Genealogies of Knowledge I Conference.